Elf on the Shelf Central: All of the ideas and instructions you’d ever need for some festive fun rounded up in one spot for your convenience here. 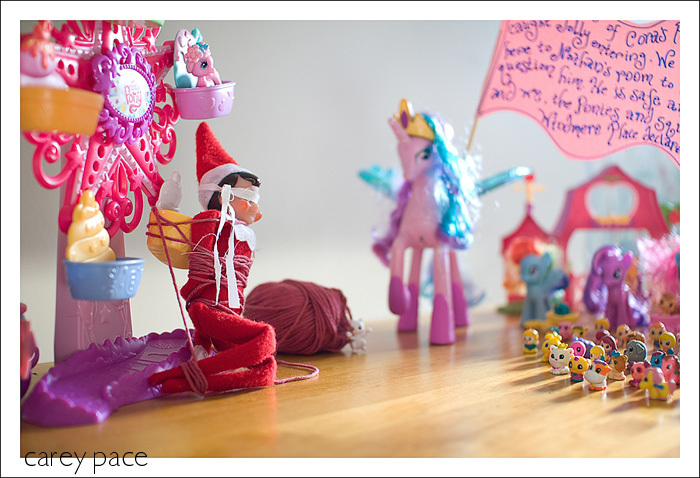 Taking your Elf Adventures to the next level can be intimidating, but it doesn’t have to be. 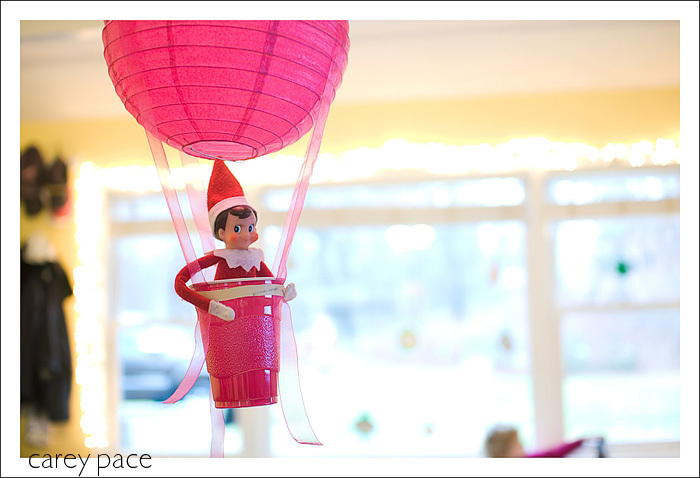 Creating props to go along with your elf can be done quickly and easily with things you have on hand. 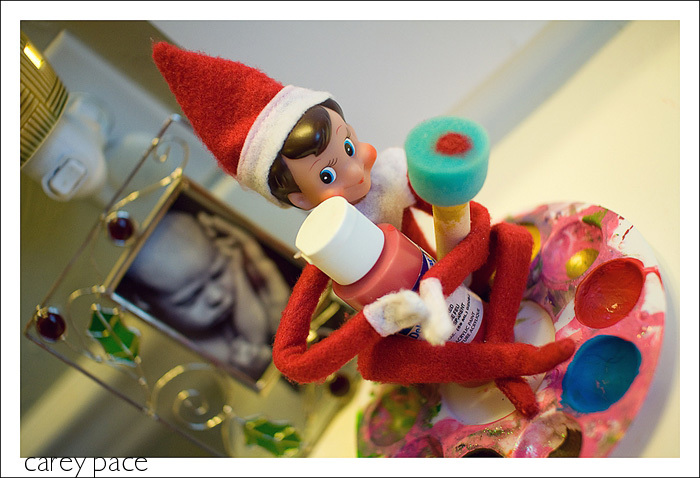 Below I’ll share a few hints and tricks to how I did some of my favorite Elf on the Shelf days from last Christmas. 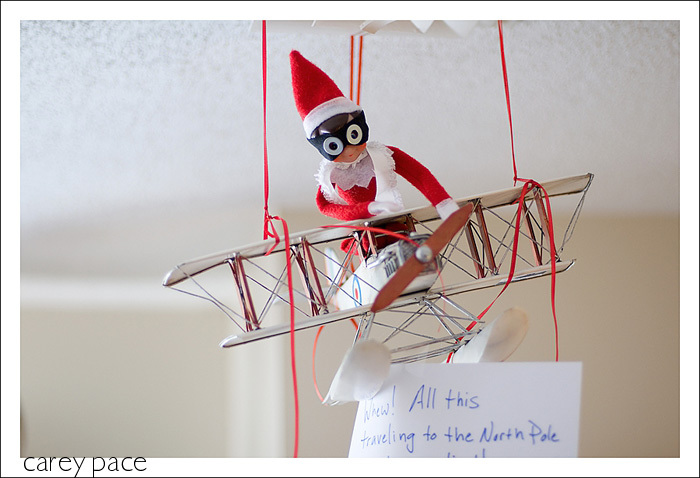 I knew I wanted to use the vintage model airplane that hangs from the ceiling in my son’s room for an Elf on the Shelf day, and my husband suggested that Jolly borrow it on a particularly tiring day for his return to the North Pole. I needed aviator goggles and a scarf, in Elf Size. I used some black fabric I had on hand that I simply cut to size. I wrapped it around Jolly the Elf’s head to determine the location of his eyes and cut slits, then small holes with scissors. I glued on washers from my husband’s hardware drawers over the slits/holes. I also glued on some small velcro pieces to attach it around Jolly’s head. Voila! Elf aviator goggles! For the white aviator scarf, I used the frayed selvedge edge of some white fabric I had on hand. Worked perfectly. (even if my kids are too small to appreciate those details!) The most challenging part was getting him Jolly up there, over my son’s bed, while he was sleeping! I combined two ideas I’d found on Pinterest for this one, but I love how it turned out. I used more of the white fabric to create the blindfold for the Elf. I used a ball of yarn to do the hostage tying. And of course, having Hacked my Elf, I could pose him how I needed to so he looked all pitiful with his hands behind his back. Since we write a note from our Elf every day, but Jolly had been captured for this idea, I chose to write the note from the Toys, instead. 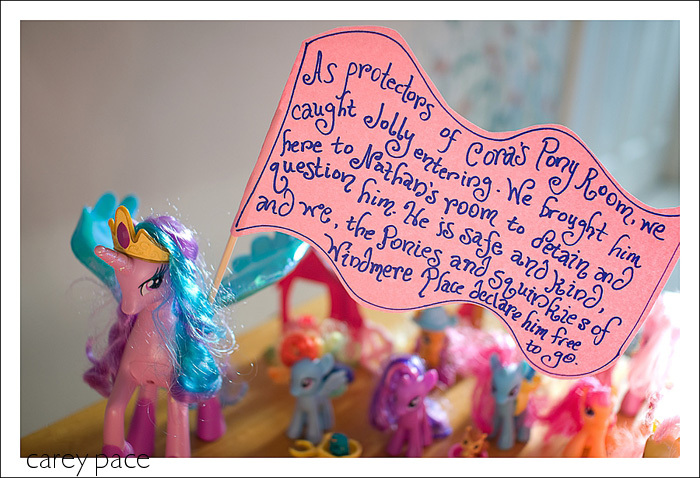 My daughter was really, really into My Little Ponies and Princess Celestia at the time so this was WAY cool. 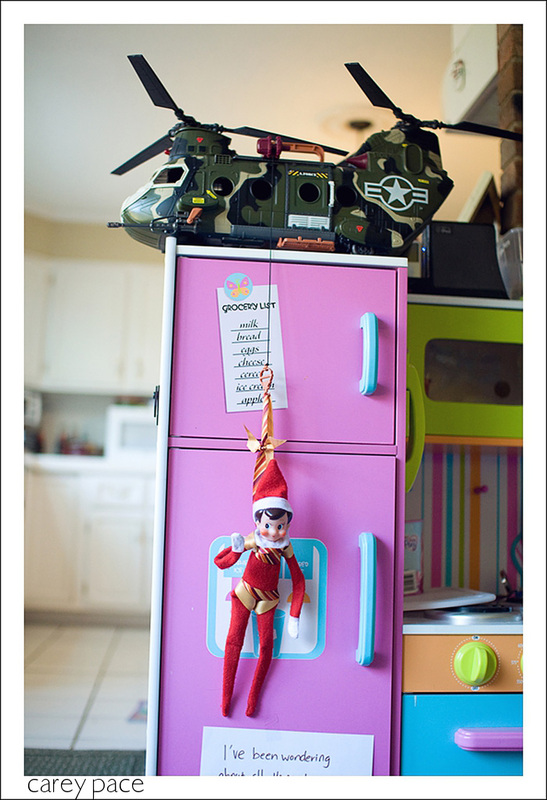 I used some ribbon I had on hand to create a harness of sorts to suspend Jolly the Elf from the cargo hook on my son’s large helicopter toy. I tried to remember how all up in your business the zipline or rock climbing harness was whenever I had the opportunity. The kids really loved this one. This one was so simple but has such a great impact with the kids. I used a paper lantern from Hobby Lobby and tied ribbon to the top metal suspenders that hung down around the lantern. I attached the ribbon to a pink Solo cup using a rubber band. Regular tan color was all I had, unfortunately. We hung the lantern from the ceiling fan in our playroom. If you were planning ahead though, consider purchasing this really cool hot air balloon basket to go with your lantern, or perhaps even buy this hot air balloon decor and use it in your kids’ room afterward! I was sooooo excited when I saw this pin on Pinterest. I just knew the kids would get such a kick out of it. I waited until they were good and asleep, but still in that early super deep phase of sleep and wouldn’t wake when I did it. I dotted their little noses with my red acrylic paint and held their hands away from their face until it could dry. It doesn’t take long. I could not wait for them to awaken the next morning. Imagine my disappointment when they emerged from their bedroom with no red noses!!! What I discovered was that acrylic paint dries fairly quickly, but also rubs off quite easily. Which is apparently a problem for my face-rubbing-in-their-sleep children. So I suppose you may want to go with something other than paint for this one, if you dare to try it. I’m going to try it one more time, with some actual face paint or red lip liner, and dust it with powder. I was at a Mary Kay party once and the consultant demonstrated how putting face powder over eye liner sets it and it won’t rub off. We’ll see if it works for lip liner, I suppose! Carey Pace is a Lifestyle Photographer and Stay and Home Mom in Kingsport, Tennessee who loves to write and capture the magic of childhood with her camera. You can find her at www.careypace.com and on Facebook. I just bought my first elfs this year and looked at your settings. I’m curious about putting the wire in them to pose them so if you could send me the directions or tell me where to find them,I’d appreciate it. I’m putting red and green buttons on a tall styro tree and will balance the ladder at the top, with one of the elfs hanging a string of silver beads on it. haven’t quite decided what to do with the large and three small ones but I have several different trees that I’ve made from paper mache and styro.